Just reflecting on my G20 experience last week and whether asking for the HG10 was the best choice. Yes. It was. I just asked Colin from 1000heads when I saw him at the Oxford Tuttle to see if I could get a loan camera because they had run the HG10 trial that I was part of before and I knew it worked well for me as a combination video and stills camera. 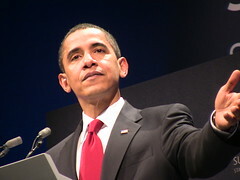 demonstrate the quality as a stills camera, that pic above of Obama is at the full extent of the zoom, without a tripod. As a video camera, I thought that I’d be mostly zipping around with my flip for interviews and using the HG10 for stuff that needed to be higher quality especially with zoom. It turned out that pretty much all the video I shot was with the HG10. This is because switching from video to still and back again is so simple so I just wandered around with one camera. It meant that I had to be a bit more ballsy to stand up at the front with the big camera boys and a couple of times in briefings I was told that I couldn’t video and had to point out I was just taking stills. Minor hassles given what outputs I was able to get. I could have done with some time to mess around with the colour balance for the video – a lot of it looks more washed out when processed than it did on the viewfinder – but of course I’d left it to the last minute to get it. I’ve blogged everything I shot, I think, but it’s all here if you want to compare and contrast. Make sure you check out the HD versions. Big thanks to Canon and to Colin & Donna at 1000heads for facilitating the process – now what do I have to do to get to keep this baby?